Every spring, many public and private high schools offer Advanced Placement (or AP) exams to their students. Those who score well on a specific exam usually qualify for college credit in that subject area. This can be a great way to trim time and costs from a student's college career. These same schools typically offer dedicated AP courses to prepare their students for the individual AP exam subjects. However, these preparatory classes are not a requirement for taking the exam. Any student who believes that he or she has mastered the subject material may take an AP exam. This means that homeschool students have an equal opportunity to take advantage of the amazing benefits that AP exams provide! If your student is interested in earning college credits through the AP exams, you'll want to start by becoming familiar with the College Board's website. There you can find a wealth of information about each AP exam, including details on registration, descriptions of individual courses, an exam calendar, and fee information. All AP Exams are given in May, so your student has a full school year to study and practice the exam topics. The College Board has a list of special instructions for homeschool students. It’s important to clearly identify where your student will take the exam, preferably at the beginning of the school year. AP exams cannot be administered by parents. You must register with the AP coordinator at a local public or private school that can administer the exams to homeschool students. Don't spend a full year preparing for an exam only to find at the last minute that the exam is not available at your local school! So how do you find a school that will allow your student to take an exam? Your best bet is to contact the College Board to get a list of participating schools in your area. Make sure to let them know you need a school that will work with homeschoolers. Then contact the AP Coordinator at that school and obtain information about exam fees and registration. The AP Coordinator will use a special state code for homeschool students to keep your scores separate from their school's. The deadline to register with your AP Coordinator is March 1, so circle that date on your calendar! For specific test dates, you can find a full calendar on the College Board's AP website. The testing procedure for these exams is similar to taking the SAT or ACT. Your student will arrive at the school on testing day and will complete the exam under supervision of a trained proctor. Once complete, the exams will be sent off to the College Board for scoring. Testing results are usually available to you by mid-July and optionally sent directly to the colleges you specify. So once you have your student’s AP scores, how do you interpret them? Each student will receive a score from 1 through 5 on an exam, with 1 being the worst and 5 meaning extremely well qualified. Depending on the college, a score of 3 or more is usually enough to get a student some credit. Scores of 4 or 5 often count towards additional credit. If your student successfully prepares for and takes enough AP exams, he or she can possibly enter college with enough credits to skip the freshman year and begin with sophomore courses. If you think about how much money you can save in tuition, boarding, and other expenses, AP exams suddenly become very attractive. Just remember that individual colleges make decisions about awarding credit based on AP scores; you should review the AP credit policies of the colleges your student may attend. Now that your students are enthused about taking one or more AP exams, how will they prepare for an exam? Public school students would typically enroll in an AP class that has undergone the College Board's Course Audit process. This means the class can be listed as AP on a high school transcript and may even be weighted differently for GPA calculations. For homeschoolers and distance-learners, some AP-sanctioned classes are available online for individual AP subjects. The HSLDA website has a listing of some of these programs. Since you are usually paying for a live teacher and online infrastructure to enable the course, be prepared to pay anywhere from $500 to $1000 or more per class. Will your student need to take an expensive course in order to sit for an AP exam? It’s important to understand the difference between taking an AP-sanctioned class and taking the AP exam. Just taking an AP class and getting an A will not qualify the student for any college credit. An AP course is simply part of the student’s transcript. The student must still take the AP exam and score well in order for colleges to award college credit. However, if you do take an AP-sanctioned course, then you can list it on your transcript using the official AP course names enumerated by the College Board. If you are looking for a more cost-effective option that will allow your student to take and pass an AP exam, there are some options. It is entirely possible to take or construct a course on your own that allows your student to learn everything necessary to score well on the exam. Homeschoolers are often very good at piecing together materials needed for specific courses, and this is possible for AP studies as well. The College Board website contains very comprehensive information on the topics your student will need to know for each exam. 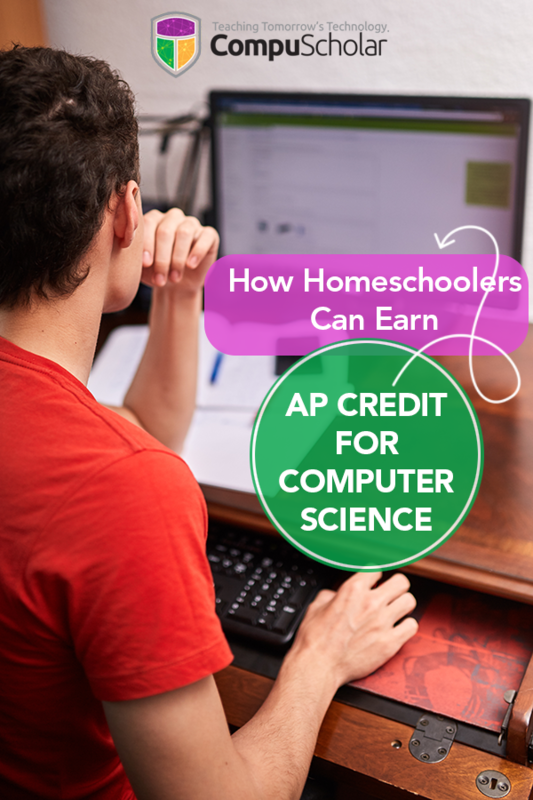 You can even apply to have your own homeschool course designated as AP and list it with the official AP course name on your student’s transcript. Keep in mind, however, that getting a course audited by the College Board is not required. Your main goal is for students to score well on the exam and win those precious college credits. Once your student has completed their AP course or self-study work, it’s a good idea for them to practice before taking the exam! The College Board AP Central website has very detailed information that will help students practice for an AP exam. This information includes partial listings of past exam questions and information on the format and scoring system for all current exams. You can also consider purchasing study guides for your exam subject. Barron's has a popular lineup of test-prep manuals that usually include multiple practice exams. Our own special interest, of course, is the Computer Science A exam. According to the College Board's statistics, perhaps 50,000 or so students take the AP Computer Science A exam year year. By contrast, hundreds of thousands of students each took the AP United States History, English, and Calculus AB exams. In this digital age where our lives and careers are increasingly shaped by computers and programmers, we'd love to see students take a renewed interest in Computer Science! How do you find out what is on the Computer Science A exam? You can review the Computer Science A Course Description for a list of specific topics. 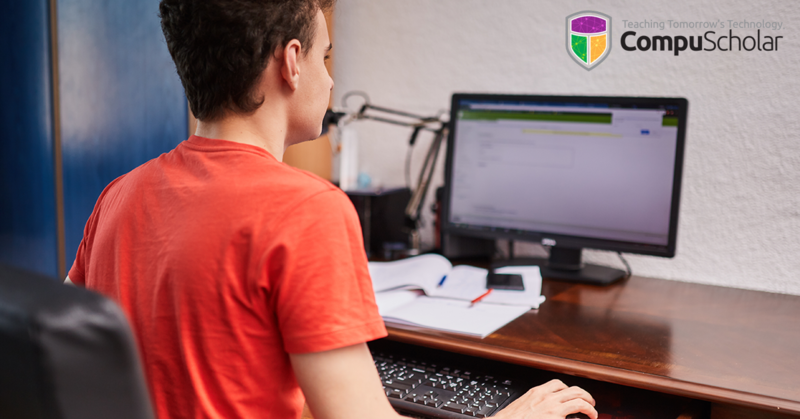 The Computer Science exam tests the student's knowledge of both general computer programming theory and hands-on practical programming skills using the Java language. 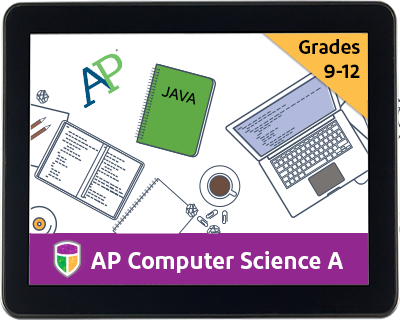 CompuScholar's Java Programming self-study course covers all of the topics on the AP Computer Science A exam, and it is one of the courses recommended by the College Board. We even have a pre-approved syllabus you can use to help you complete the course audit process, if you wish to list the course as an AP course on your transcript. On exam day, be prepared for a 3-hour test that includes both multiple-choice and free-response sections. Students will demonstrate ability to read extended problem descriptions, write code, and solve problems. Whether you sign up for an AP course or plan your own self-study with a quality textbook, participating in the AP process and scoring well on the exam can be a rewarding effort! Students will get early experience with college-level material that may help guide their career and college choices. Should your teen be interested in Computer Science as a career, rest assured that the United States and other countries are in need of qualified programmers to fill many job opportunities. Computer Scientists enjoy excellent job prospects in a growth industry. Computers and software will continue to play a more influential role in all our lives, so why not help architect the digital revolution instead of merely hanging on for dear life?